You got those studded leather pants on tight? 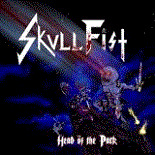 Then Canada’s up-and-coming horn patrol Skull Fist should be right up your alley. Employing the kind of rapid fire, no-frills and balls-out approach to metal that should make all fans of bands like Exciter or 3 Inches Of Blood feel all warm and cozy in them knickers while also giving the appropriately deep nods to early-years Maiden and Priest, this quartet certainly grabs your attention with ease, especially considering that this is their debut full-length. There really isn’t that much nuance to pick out from the song crop of this record. Nearly all songs charge at the listeners with rapid guitar riffs aplenty and scorching guitar solos that probably left a few fretboards smouldering on the studio floor. With titles like Ride The Beast, Get Fisted, No False Metal and Attack, Attack, you can get the hang of their attitude pretty easily. Most of the tracks employ a very fast pace and good for them because at this point the band definitely sounds its best with the gears revved to the extreme. In fact, the one mid-tempo stomper they’ve got here with Commit To Rock is by far and wide the most flaccid and boring track on the album, which makes the quickness suit the group even better. Although I have to say that the first half of the album brings the hooks much better than the second, where the overwhelming blaze of the band’s energy has lost its biggest force. The gritty yet punchy production suits the album very well and the group’s playing is solid throughout. I can see singer/guitarist Jackie Slaughter really being a hit or miss with listeners. Think Vince Neil but with a bit more power and actually even more high-pitched than him. Hell, for those of you who have the ye olden 80s chops to remember the likes of Nitro’s Jim Gillette or Vinnie Vincent Invasion’s Robert Fleischman, then you can imagine the nearly helium-induced heights that Slaughter almost operates in. So yeah, overall Skull Fist’s debut shows a band that provides tons more enthusiasm and attitude than any sort of innovation but heck, does that make most of this record less enjoyable? Not really. As I said, over 40 minutes of material this one-dimensional may get numbing depending on your mood. But when in need of some unashamed, full-blasting heavy metal, this one dimension is powerful as hell. A solid first offering from a band that shows much potential.